Environment Abstracts, USA; Cambridge Sci. Abstracts, USA; Geosystems, UK; Materials Information, USA; Chemical Abstracts; Scopus. 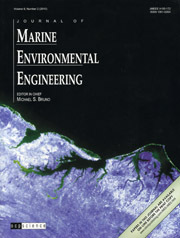 The primary aim of the Journal of Marine Environmental Engineering is the dissemination of technical information among scientists and engineers working on marine environmental problems. The journal is unique in both its interdisciplinary nature, and its focus on applied science and engineering. Articles generally describe practical solutions to real world environmental problems, and as a result, the Journal of Marine Environmental Engineering provides a vehicle for the publication of papers not normally found in traditional research and development orientated journals. The scope of the journal includes, but is not limited to, those scientific and engineering disciplines addressing complex environmental problems in ocean and estuary waters and inland seas. Topics covered include laboratory physical testing, field testing, computer modeling, coastal and ocean processes (water levels, currents, tides and waves), sediment and contaminant transport processes, offshore and coastal structures, ocean outfalls, marine waste disposal, ocean circulation, ocean instrumentation, sea level rise and coastal resiliency, habitat enhancement and creation, point and non-point pollution analysis, fisheries management, dredging and dredged material management, beneficial use of dredged material, beach erosion and management, oil spill prevention and remediation, and aquatic toxicology.